PHOTO COURTESY A24 Menashe Lustig and Ruben Niborski in "Menashe." 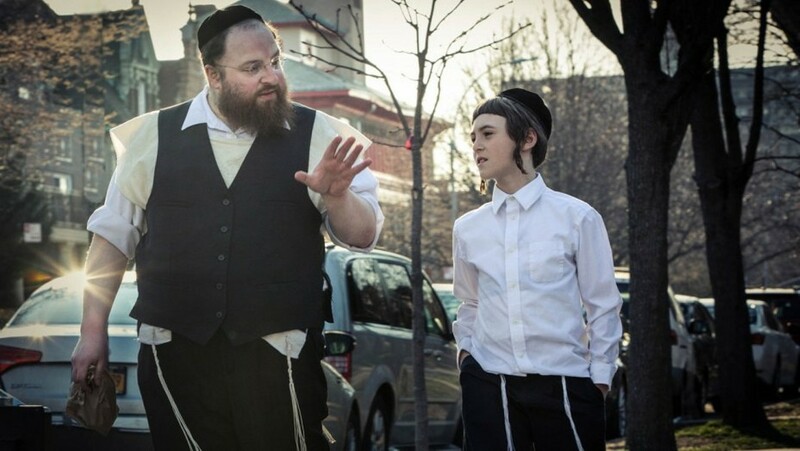 Set in an ultra-orthodox Jewish community in Brooklyn, “Menashe” is a gentle dramedy about a Hasidic widower named (you guessed it) Menashe (played by Menashe Lustig), as he muddles his way through life. The charismatic, but rather hapless young man is cursed with a personality that often butts up against the conservative traditions of his religion, and he struggles to fit in with this most insular of communities. But Menashe struggles to do his best, working as a grocery clerk and raising a young son whom he’s not allowed to live with. Hasidic law forbids a man without a wife from raising a child, so if he wishes to remain, his options are limited: remarry immediately or agree to surrender custody of his young son Rieven (Ruben Niborski) to his more stable brother-in-law Eizik (Yoel Weisshaus). The film’s unique cultural setting adds an intriguing sense of specificity and complexity to its ultimately somewhat familiar story. Working from a script co-written with Alex Lipschultz and Musa Syeed, director Joshua Z. Weinstein brings a deep sense of empathy for his characters, an ability he’s built up over his time as a documentary filmmaker. A non-professional actor, Lustig brings an endearing awkwardness to the role. Under Weinstein’s sure hand, “Menashe” offers what movies can do best, opening a window into a world few of us would otherwise ever see.